BLAEU - Cenomanorum Galliae regionis typus: Vulgo Le Mans. BLAEU, W. - Cenomanorum Galliae regionis typus: Vulgo Le Mans. Cenomanorum Galliae regionis typus: Vulgo Le Mans. 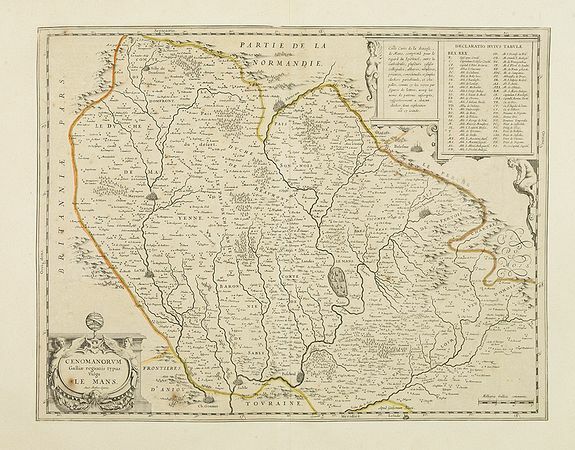 - BLAEU, W.
Title : Cenomanorum Galliae regionis typus: Vulgo Le Mans.. Size : 15.0 x 19.6 inches. / 38.1 x 49.8 cm. Description : Detailed map centered on Le Mans. Prepared by Mathieu Oger, French Priest and cartographer. Ornate title cartouche on the lower left corner in Latin. Condition : Original map collated on large thick sheet of paper. Paper age-toned. Margins cut till plate mark. A spot on title cartouche.